Tonight was one of those nights I will remember for a long, long time. Why? 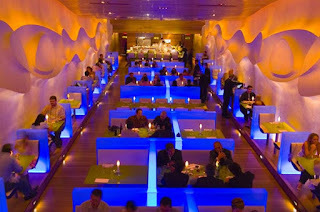 Because there is nothing like eating at the restaurant of an Iron Chef. Well, there is one thing, and that is to enjoy that meal with an old friend. A Jesuit priest from Malta once told me that you know someone is a real friend when you can meet up with them after years of absence and pick up where you left off, moving forward and never looking back. Tonight was that exactly. Where did we celebrate our renewed friendship? 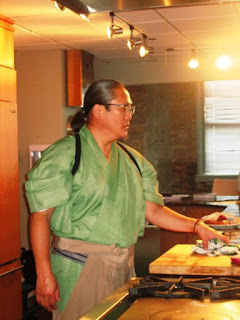 With Philadelphia's own Iron Chef, Masaharu Morimoto, of course. There are a few meals in your lifetime that stand out, and tonight's chef's choice menu at restaurant Morimoto was just such a meal. It was utter luxury, where flavor, texture, creativity, and presentation came together just like they have for years for the judges on Iron Chef and Iron Chef America. The meal began and finished with my all time favorite sushi, toro, a fatty tuna belly so buttery and luscious I felt like a shogun of old, offered delicacies reserved for he rules all. Jealous yet? You should be. Next week, Galatoire's New Orleans. I *AM* jealous! Love the menu, love the decor too. I hope we can go when I someday visit!